In a large bowl, mix together coconut, sugar, vanilla extract & condensed milk. If the mixture is too dry, add additional milk until it all just comes together. 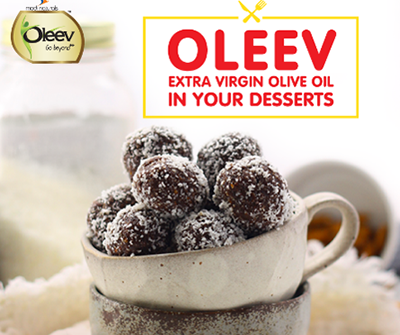 Roll the mixture into 1-inch balls & place on a wax paper (brushed with Oleev Extra Virgin Olive Oil) lined baking sheet. Freeze for 15 minutes. Melt the dark chocolate until smooth. Remove the coconut balls from the freezer & individually roll in melted chocolate to coat. Place back on a wax paper lined tray & sprinkle with additional coconut & top with an almond.